Fungi that tolerate very high environmental NaCl concentrations are good model systems to study mechanisms that enable them to endure osmotic and salinity stress. The whole genome sequences of six such fungal species have been analysed: Hortaea werneckii, Wallemia ichthyophaga and four Aureobasidium spp. : A. pullulans, A. subglaciale, A. melanogenum and A. namibiae. These fungi show different levels of halotolerance, with the presence of numerous membrane transport systems uncovered here that are believed to maintain physiological intracellular concentrations of alkali metal cations. Despite some differences, the intracellular cation contents of H. werneckii, A. pullulans and W. ichthyophaga remain low even under extreme extracellular salinities, which suggests that these species have efficient cation transport systems. We speculate that cation transporters prevent intracellular accumulation of Na+, and thus avoid the toxic effects that such Na+ accumulation would have, while also maintaining the high K+/Na+ ratio that is required for the full functioning of the cell – another crucial task in high-Na+ environments. 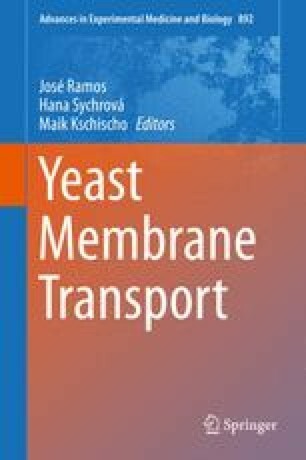 This chapter primarily summarises the cation transport systems of these selected fungi, and it also describes other membrane transporters that might be involved in their mechanisms of halotolerance.